Marta Górnicka’s Hymn to Love. Photo: Magda Hueckel. 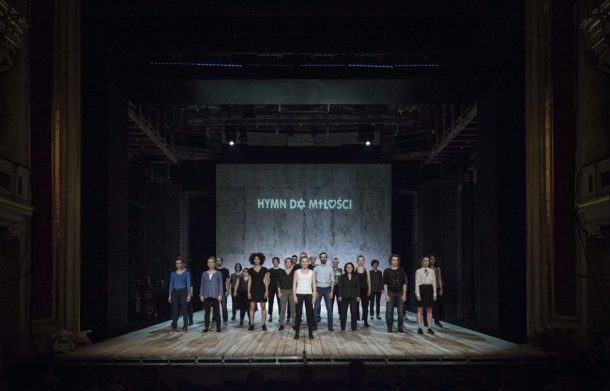 In the Summer of 2017 as a result of coproduction between Berlin, Poznań, and Warsaw, the Gorki Theater in Berlin presented three notable Polish performances: Hymn to Love by Marta Górnicka, Klątwa by Stanisław Wyspiański, directed by Oliver Frljić, and The Two Moonthieves by Krzysztof Minkowski. Here, I discuss Hymn to Love, the newest performance of Chór Kobiet, the acclaimed ensemble created and led by Marta Górnicka, that encapsulates the issues the festival organizers highlight in their statement. Even though Chór Kobiet (in literal translation “A Choir of Women”) was initially composed solely of women of various professions and age groups who worked with Górnicka on performances in their spare time, today the group comprises both women and men representing a very broad spectrum of society. What strikes the audience from the very beginning in Hymn to Love is the stress on the difference and diversity manifested by the composition of the choir members: we see tall and short, younger and older people, adults and children, different races, and even people with disabilities. Thus, the chorus represents a real slice of the European (if not world) community. This expansion in the human composition of the performers signals the accompanying expansion in the scope of Górnicka’s social and political interventions into the larger society. As the earlier performances of Górnicka such as Choir of Women, Magnificat, Requiemmachine, Mother Courage, and Poland – in Lord’s Name, Hymn to Love addresses the most vital, painful, and often suppressed issues of our time such as oppressive political practices, abusive male-female relationships, the dominance of certain institutions such as the Catholic Church in Poland, the exploitation of women, and the growth of intolerance and hate. One of the most prominent issues the group targets is the ascending nationalism and the growing resentment towards multi-culturalism manifested by an unfavorable, even hateful, attitude towards the influx of refugees in Europe and other parts of the world. At the beginning of the performance we hear excerpts from a sickening statement by the Norwegian terrorist Anders Breivik demanding that we “ honor [him] for [his] seventy-seven victims” since, “actions like [his] save hundreds of thousands of people who would otherwise meet their demise in a future civil war.” But the way this declaration is proclaimed by the members of Górnicka’s ensemble leaves no doubt that Hymn to Love is an extremely bitter and powerful outcry against the hypocrisy of nationalistic politics and indifference to violations of basic human rights. The performance is composed of meticulously orchestrated sounds and words uttered with concentrated energy that often transforms the words into incomprehensible hisses, shrieks, bellows, and whispers. Every movement and gesture of the actors and actresses serves to amplify the sonorous quality of the verbal expression. The text of the performance consists of melodies and scraps of text from both traditional and contemporary popular culture. The performers chant and shout, often almost spitting out the slogans that in the recent years have contaminated the newspapers, television, billboards, and other public media in Poland: “Let the Poles be born” (“Niech Polacy się rodza”), “Our country, our Poland” (“Nasz Kraj! Nasza Polska!”), scream the actors. At times the words from the stage such as “Guest home, God at home” (“Gość w dom Bóg w dom!”) recall Polish traditions of hospitality, friendliness, and openness towards other people, but when clashing with purely nationalistic, xenophobic statements, and contorted facial expressions of the choir members, they sound bitter and sarcastic. Polish patriotism turns sour when the chants incessantly recall the painful history of Poland, demanding constant sacrifice and readiness to fight for the country’s independence and freedom. In the context of Poland’s twenty-eighth year after the fall of communism and the fifteenth anniversary of successful membership in the European Union, these slogans commiserating with Poland’s troubled history truly sound cynical and paradoxical. They highlight the language of the current Polish conservative government’s vitriolic propaganda against almost all achievements of the post-communist era in the sphere of LBGT rights, religious freedoms, and multiculturalism that represented the aspirations of the progressive, open segments of post-communist Polish society. Such words as “NARÓD” (“NATION”) or “POLSKA” endlessly repeated and “churned out” by the performers become worn out and mangled, thus undergoing a process of degradation and depletion of meaning simulating the current Polish media practices. The gestures and movements of the performers, through the constant juxtaposition of facial expressions and body movement, amplify the parodic, denunciatory power of words. It always amazes me how much Gornicka’s actors can express with such meager means—they perform on an empty stage, with no costumes, no make-up, no special effects. In this performance only a few scattered teddy bears created an additional element on the usually empty stage. The performers do not use any studied or meticulously exercised body movements. And yet, with only rudimentary facial expressions, basic gestures, rhythm, and exquisitely tight and measured voice quality, they reach the heights of expression and thrill their audiences. At one point we hear something like a sweet, soothing church hymn calling for peace. The actors smile warmly and then in an instant their mouths stretch into sneers and forcefully eject one word “CONVERT.” Vigorous movements of the actors’ arms and whole bodies amplify the coercive, pestering nature of this command: “CONVERT,” “CONVERT,” bellow the mouths from the stage, “CONVERT,” “CONVERT,” roar contorted faces and bodies. Górnicka already strongly accentuated her and the Choir’s anti-Church attitude in her Polska – Oto Słowo Pańskie (“Poland – In Lord’s Name”) performance that foregrounded the secondary and mostly instrumental position of women in Polish culture strongly enforced by Church teachings. Similar overtones permeated Hymn to Love, but here the emphasis was on the Church’s intermingling with recent Jarosław Kaczyński’s conservative government and Church-orchestrated politics. In the performance, we recognize Polish traditional patriotic songs such as “March Polonia” deformed and mangled by the quiet, but incessant tunes reminiscent of church hymns and Christmas carols. And, more importantly, very well-known tunes from the Communist era sometimes seep into the musical background of the performance, thus connecting the present political practices to the well-known communist ways. But what dominates in the performance is the strong rejection and accusation of the anti-refugee propaganda incessantly publicized in Poland and reverberating all over in Europe—the reference to Breivik is only one example and the performance subversively quotes Osama Bin Laden and other Islamic leaders. The repetition of all sorts of nationalistic, anti-refugee slogans such as “Our country, our Poland” sounded especially ominous in Berlin, a city scarred with its painful Nazi past. And the Berlin audience responded to all these infamous references sometimes with moments of deep silence, sometimes with relief—that time for Germany was over and now Germany is the most refugee-friendly country in Europe. But the ghost of Nazism in an eerie way brought to prominence the foreboding overtones saturating the propaganda language in Poland today. Throughout the performance the actors on stage march, group and regroup, sneer, and yell, and Górnicka, like a music director from the pulpit, while standing amidst the audience, triggers all these powerful moves and bellows, bringing to the fore complex subtexts and references, creating a rich, emotionally charged performance. Through the masterful orchestration of emotion, irony and paradox, using powerful, but basic movement and sound, she produces an unforgettable sonorous tapestry of our current love-less reality. Krystyna Lipińska Illakowicz teaches Polish language, theatre, and film at Yale University. She writes on Polish-American cultural exchanges, theatre, and film. She has published both in English and Polish about Witold Gombrowicz, Bruno Schulz, Tadeusz Kantor, and others. Currently, she is working on a book tentatively titled The Image of America in Poland in the 1920s and 1930s.